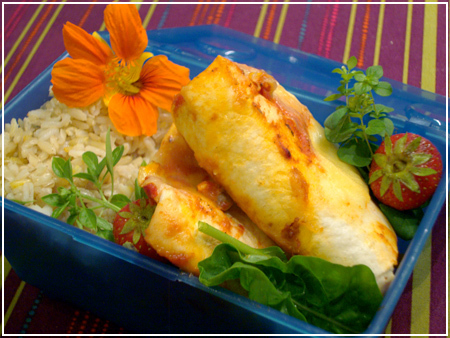 Vegetarian Burritos stuffed with beans, nuts and chili, brown rice, some homegrown herbs and rucola and two strawberries for dessert. This should get me through Friday! PS: I added a recipe to yesterday’s post since I had a few people mentioning they never had mushroom pie. Here you go then! The last of the chili sin carne from the freezer under carrot and cheese flowers, parsley, homegrown cherry tomatoes, the last two lentil balls, a fudge candy, and fried potato slices as the carb. 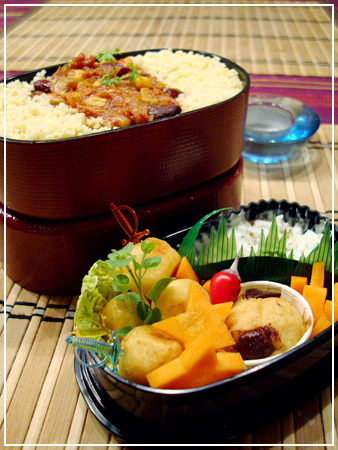 Big box (top): Millet and chili sin carne decorated with parsley. Millet is actually rather tasty, but not very different from couscous texture and flavour-wise. Mmm. 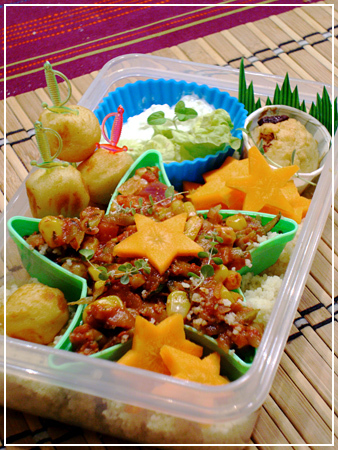 Small box (bottom): Tiny croquettes on picks decorated with oregano; mini chocolate chip muffin (made in a condiment cup with a tiny amount of muffin dough), star-shaped carrots and a cup of tsatsiki. Homemade tortillas (half corn-, half wheatflour) filled with woked veggies, salsa, greek yoghurt, orange grated cheddar and a few leaves of fresh cilantro. Cherry tomatoes and sugarpeas on the side and a silicon muffin cup with sugared ginger sticks and blue grapes. Photo credit goes to my boyfriend because my nose itches so much I literally couldn’t get the camera to focus. Stupid summer cold! 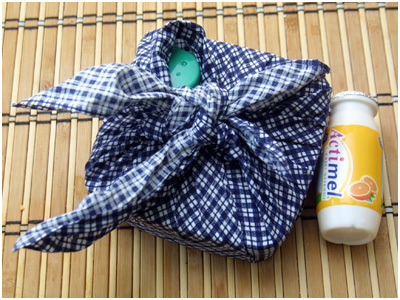 Bento #101 – Eyes bigger than the box? I wanted to make baked burritos oringinally which would have fit the box better on account of being rolled up and sealed by lovely melted cheese. But my kitchen was a mess and I kicked myself to clean it up instead, so I didn’t have time for that… so wraps it was! They are filled with red kidney beans, onions and corn in tomato sauce (what I had originally planned to put in the burritos), and salad leaves. 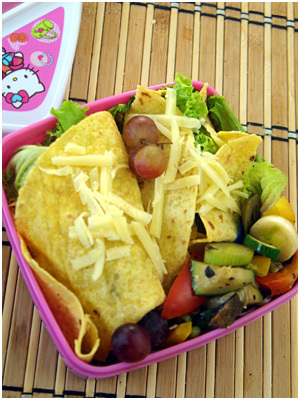 Sprinkled on top is grated cheese, bell pepper pieces (for color) and a dab of avocado-yoghurt dip. On the side we have roasted veggies from last night’s tortilla dinner, a kitty with more avocado dip and grapes. I think that this recipe is even mostly glutenfree, since I used corn tortillas for the wraps. But I’m not entirely familiar with glutenfree – what do you think? The kitty had to move outside the box though, it was mainly there to support the wrap for the photo. 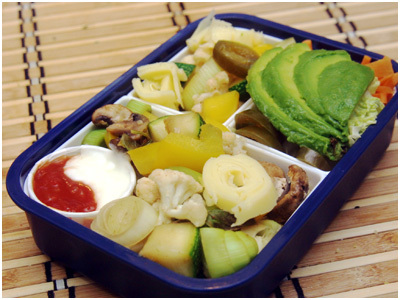 Wok-fried zucchini, leek, yellow bell pepper, mushrooms, cauliflower and fresh basil with taco seasoning, a yin-yang of sourcream and salsa, cheese rollups, avocado, jalapeños, salad, carrot and salsa. Not shown: two corn tortillas to fill with the delicious mixture! I just love tortillas and Fajitas. 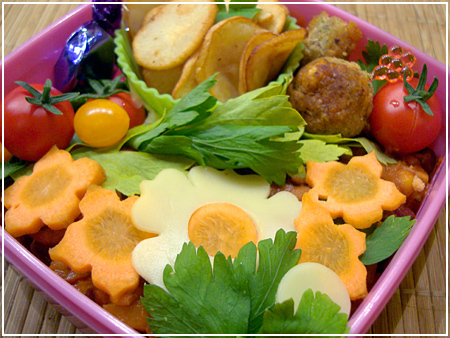 That’s why they keep popping up in my bento – well, that and that it is lovely, filling food that I usually have leftovers after making. 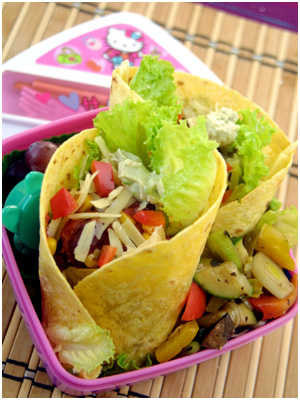 There is nothing at all that should keep you from enjoying them if you are vegetarian – veggie Fajitas are great without anything to replace the meat. In Mexican restaurants, they often serve a pan of fried meat pieces and vegetables to fill your tortilla with, and leaving out the meat does not influence the taste in a bad way at all! I usually stirfry diced zucchini, leek or salad onion, bell pepper (red and yellow for a great contrast, sadly I only had yellow in the house! 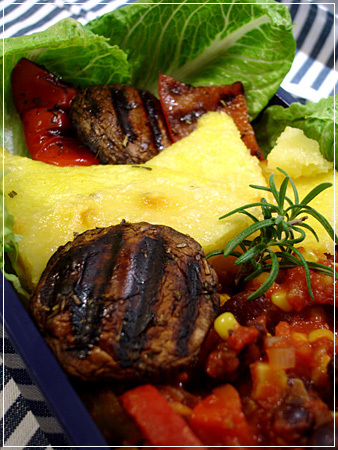 ), mushrooms as a base and add any other vegetable that I find in the fridge that needs using up to stretch it. 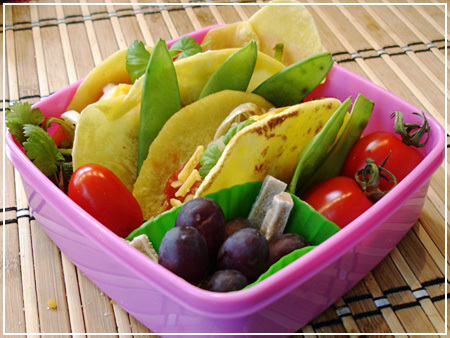 Fill the tortillas with a spoon of veggies, salsa, sourcream, and some shredded cheese and top with salad and carrot shaves. Enjoy! If you absolutely feel the need to make burritos or have a meat-replacement, saffron rice, quinoa, or a sauce of shredded zucchini, onion and crushed tomato goes well with it. There. That’s all you ever need to know about veggie tortillas. Now go out and make your own! What are you waiting for? There really is nothing to it! You could have sliced the veggies already by the time it took you to read this!